Most businesses are obsessed with growth. Growth is by no means the only strategic objective worth pursuing, but it is certainly one of the more common ones. Growth creates economies of scale, creates employment, generates shareholder returns, bolsters executives' egos, and of course means more customers getting more of the products and services they want. In a very real sense, a business which is growing, especially one which is growing relative to its competitors, is seen to be winning. However, as H. Igor Ansoff showed with his now famous matrix in 1957, there are at least 4 different types of growth. Market Penetration is achieved by selling higher volumes of the same products and services into existing markets. Product Development involves developing new products or services to sell into existing markets. Market Development involves finding new markets to sell existing products or services to. Diversification involves selling new products or services to new markets, and is considered the most risky strategy on account of it having to deal with two unknowns at the same time. There is more to these four growth strategies than meets the eye, so we will look at each of them in turn. 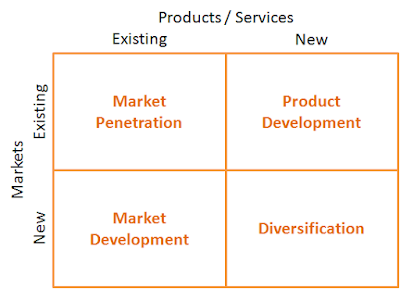 For most businesses, market penetration is the default strategy. Of course, if the market itself is growing, then, all other things being equal, the business will grow along with it - they say that "all ships rise with the tide". Volume-selling: selling larger quantities of the same product to existing customers - perhaps by increasing distribution and/or offering volume discounts. Up-selling: selling higher value products to existing customers - perhaps a more expensive model. Cross-selling: selling additional products to existing customers - such as add-on or complementary products. Competition: convincing customers who would otherwise have bought from your competitors to buy from you instead. New customer development: finding customers within the market who are not already using the product or service at all, and convincing them to start. Market penetration can be achieved by tweaking the marketing mix (reducing price, increasing promotion and/or distribution, tweaking product features or packaging, etc. ), or by acquiring a competitor. Entering a new geographic region - such as a new region or country. Targeting a new customer segment - for example, the youth market, or small-to-medium enterprises. Success in this strategy depends on how insightful and nuanced your customer segmentation is in the first place. Developing new distribution channels - for example, expanding from wholesale into retail distribution, or targeting a different type of distributor. Expanding from the consumer to the corporate or public sectors, or vice versa. The exact means of entering those markets will depend on numerous factors, such as different regulatory regimes, different socio-economic norms, and whether a competitor already exists in the market or not. New product development, which typically involves research and innovation in order to create something which the world has never seen before. Product licensing, which involves acquiring the rights to manufacture a product developed by someone else. Product sourcing, which involves selecting products which already exist elsewhere (in other geographies, or through other distribution channels) and making them available to your customers. Amazon is a great example of this approach. Which of these two are most suitable depends on many different factors, key of which are whether the business is fundamentally predicated on technical product or service development expertise and innovation (like Apple), on manufacturing expertise (like Capita), or on customer intimacy (like Amazon). In practice, new products exist in a continuum from completely new and novel products, through products which are reconfigurations of existing products, to products which are merely incremental improvements to existing products. The resulting products may be own-labeled, co-branded or white-labeled. Diversification is the most risky of the four strategies as it involves all of the complexity and risk of Market Development and Product Development at the same time. For this reason, businesses often pursue diversification through acquisition. That is, by acquiring a business or team which already has a track record of selling those products or services in those markets. Even then, the acquirers ability to understand and oversee the acquired business may be a challenge. Ansoff's Matrix can be used to understand strategies in hindsight. However, it is more powerfully used to help businesses generate a complete list of strategic options for subsequent evaluation (see, for example, StrategicCoffee: 6 techniques and 5 tips for developing strategic options). As we have shown, Ansoff's Matrix provides not just the four options shown in the diagram, but a range of variations within each of the four.